Provide durable and natural shelter for the bats in your area with this Uncle Dunkel's Triple Chamber Bark Clad Bat House. Crafted from lasting wood and sporting a poplar bark front cover, this home is sure to offer bats a fantastic roosting spot. Each of the three chambers measures 0.7" in depth, with polyethylene mesh netting on each for the bats to easily grip. A 0.25" wide, horizontal gap on the front of the shelter provides ventilation, and an extended base allows the animals to easily enter the unit. 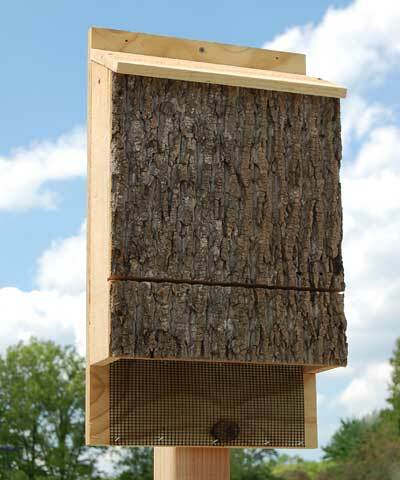 Its generous size is fantastic for housing up to 300 bats, and the triple chamber design allows bats to create bachelor and nursery colonies naturally. Three predrilled holes on the top slat make it simple to place the home against a wall or fence, or attach an adapter (not included) to the generous back panel for pole mounting the item. Welcome pollinators into your yard with this Triple Chamber Bark Clad Bat House. Made in the USA.